The 11” of snow accumulation received May 1-2 has now melted down to where dust events 2-7 once again are at the surface of the snowpack at Swamp Angel, Senator Beck and majority of the surrounding landscape. With the warm and sunny weather since the 1st of May storm, SNOTEL data across the state are now beginning to report snow depths and water equivalent at or below values prior to the storm, indicating dust is fully exposed at all monitoring points. The combined dust events are bordering between "average" and "maximum" dust severity. We have had only 2 previous years that achieved the status of "maximum" dust severity in our period of record. As of right now we will classify severity conditions as "high end of average", but his may change with further data analysis. Please see plots and captions below discussing this past week in more detail. Average and minimum air temperatures are staying above freezing and the forecast is for this to continue. Over the next 7 days Southwest Colorado is expected to receive around only 0.10"-0.14" precipitation in the mountains, as you move east and north precipitation amounts are expected to increase with the mountain regions expected to see anywhere from 0.23"-0.65". Besides possibly seeing a day of cloud cover (tapping the brakes on snowmelt), it is supposed to remain sunny. 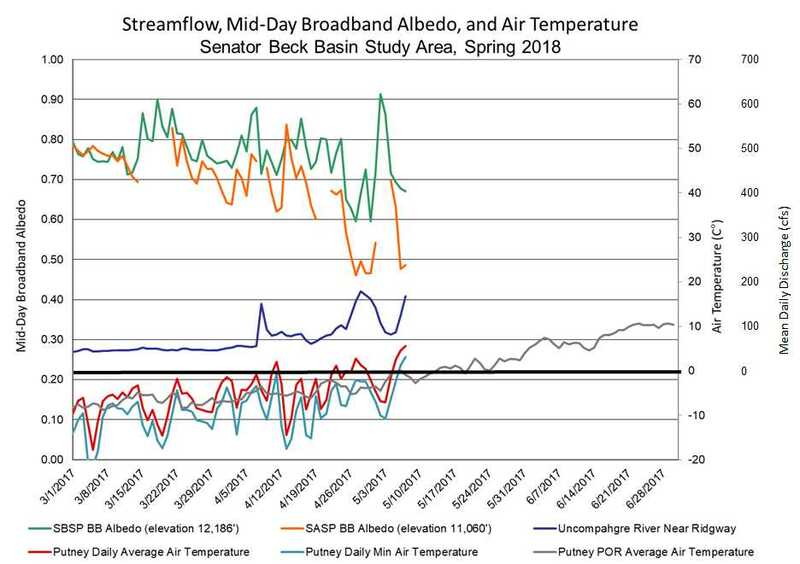 With the season's dust now completely at the surface, above freezing minimum temperatures, negligible precipitation and sunny days in the forecast, the faucet is turned on in terms of melting what little snow exists in Central and Southern Colorado. Northern Basins which are faring a little bit better - Yampa/White, South Platte, Colorado Mainstem - are projected to hold onto snow into June, but dust exposure might have something to say about that unless wetter spring conditions prevail in these Basins than are expected in the Southern part of Colorado. Please see plots and below. This morning, May 8, at Swamp Angel Study Plot. All layers are now merged. This morning, May 8, going up towards Senator Beck Study Plot. The dust severity can be seen by comparing ski tracks and sloughed areas. The May 1-2 storm brought 0.9" of water and 11" of snow accumulation plus initiated a major albedo reset. But, given the wet snow that was deposited, sunny days and above freezing air temperatures at night. snowpack albedo decayed rapidly as it gradually gave rise to dust layers 2-7, resulting in a spike in streamflow. Currently, the forecast is for continued above freezing minimum temperatures and sunny conditions. With D2-D7 now at the surface, we are going to continue to see rapid snowmelt. Over the weekend we may see a chance of precipitation, we are not expecting much (forecast is calling for 0.14" over the next 7 days), but it might provide cloud cover for a day or two, possibly slowing down melt only temporarily. 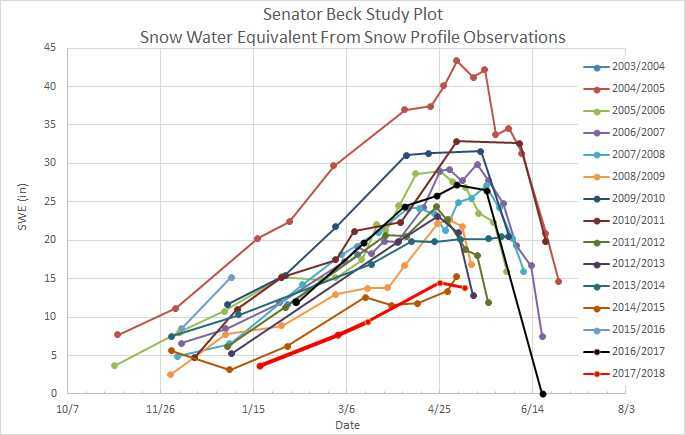 Above plot shows snow depth, albedo, and streamflow at our SBB gauge. 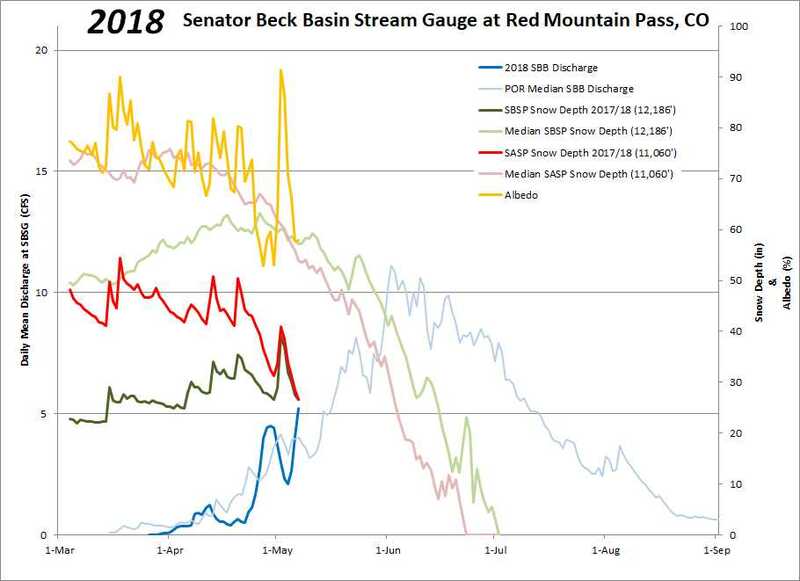 Interestingly, on May 1 median snow depth at SASP and SBSP cross over, where the snowpack begins rapid ablation at SASP and the higher elevation SBSP holds onto the snow longer into the summer and creates the second peak seen in the median streamflow data. This year, we are about a month earlier than normal. SBSP will likely hold onto the snow longer than SASP but not by much.